In the opening round of men’s singles action at the at the $75,000 Winnipeg National Bank Challenger, only one of five Canadians competing on Tuesday managed to advance to the following round with Tuesday’s action. That lone Canadian is wild card Samuel Monette of Montreal. The 23-year-old scored a huge upset with his 6-0, 6-1 victory against No. 5 seed Hiroki Moriya of Japan for his first professional win. The former Indiana Hoosier made quick work of his opponent, needing just 48 minutes to continue on to the second round at the Winnipeg Lawn Tennis Club. While he hasn’t yet advanced, Phil Bester of Vancouver remains in contention for the Winnipeg National Bank Challenger title following Tuesday’s play. An evenly-fought match was suspended late in the second set due to rain at 7-6(4), 5-5 with Slovakia’s Blaz Rola holding the advantage over Bester. Fellow Canadian Steven Diez, the No. 6 seed, was upset in his singles opener by American Raymond Sarmiento. Sarmiento defeated Toronto’s Diez 6-1, 6-4 in one hour and forty-three minutes. Also in action, Yusuke Takahashi of Japan beat Canadian wild card Jack Mingjie Lin 6-2, 6-0 and Australian Bradley Mousley moved on to the second round with a 6-1, 6-1 victory of Canadian wild card Hugo Di Feo of Montreal. On Wednesday, another crop of Canadians begin their bid for the $75K Challenger trophy. Vancouver’s Filip Peliwo meets fellow Canadian and No. 7 seed Brayden Schnur of Toronto. Wild card entry Nicaise Muamba of Laval is also in action, he faces American qualifier Alex Rybakov. No. 2 seed Peter Polansky (North York, Ont.) faces Christian Harrison of the United States, and finally Frank Dancevic of Niagara Falls faces No. 1 seed Blaz Kavcic. On the women’s side, three Canadians also contested their opening round matches on Day 2 of the $25,000 women’s event at Winnipeg Lawn Tennis Club. Charlotte Robillard-Millette of Blainville, Que. was tasked with the tournament top seed Nicole Gibbs of the United States on Tuesday. Gibbs who currently is ranked No. 117 in the WTA rankings, ousted Robillard-Millette 6-1, 6-2 to continue on with her campaign in Winnipeg. Next up, the 24-year old Cincinnati native takes on fellow American Ronit Yurovsky on Thursday. The two will battle for a spot in the quarter-finals. Two Canadians will resume their campaigns in Winnipeg on Wednesday. Carol Zhao of Richmond Hill, Ont. 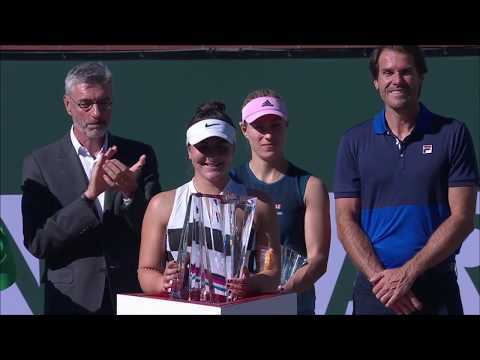 and Montreal’s Aleksandra Wozniak secured first round wins on Monday, and will hit the courts again for their second round matches on Wednesday. Zhao opens up the day’s action when she takes on Shilin Xu of China. On Monday, Xu upset No. 2 seed Danielle Rose Collins of the United States. To follow, Wozniak takes on No. 6 seed Hiroko Kuwata. For complete scores, full draws, and live results, please visit the official tournament website and continue to check back here for more news on the Winnipeg National Bank Challenger, running from July 8-16 in Winnipeg.